Last Sunday, I rode ‘The Only Way’ Sportive with Lisa from Fat Girl Fit, and her friend Helen who is training for the Newcastle to London bike ride. We went for the 51 mile route, which was the shorter of the three distances on offer. The sportive left from Colchester Football Stadium on took us around the villages of Essex and Suffolk. I rode a similar route earlier this year at the Equalizer Sportive and was keen to go back and tackle the ride again without ice on the roads! I ride at roughly the same pace as Lisa and Helen, so it was nice to stick together on our peloton of pink bikes overtaking all the men! The route was quite undulating with some fairly tough hills along the way. I made the effort to ‘attack’ the hills as much as possible. I figure the quicker I get up them, the quicker I can recover! The ride was well signposted (I didn’t take any wrong turns for once) and there were marshals at the busier junctions. The roads were open, but there was not much traffic to contend with, just the occasional farm vehicle. We reached a feed station at 38 miles, but we only stopped very briefly for a quick drink. With only 12 miles to the finish line, we felt it was best to press on rather than stop to refuel. I felt strong at the end of the ride- 51 miles used to be quite a challenging distance for me, but now feels very doable. Could I run 13.1 miles straight afterwards though? That is what I’ll be working towards for next summer! 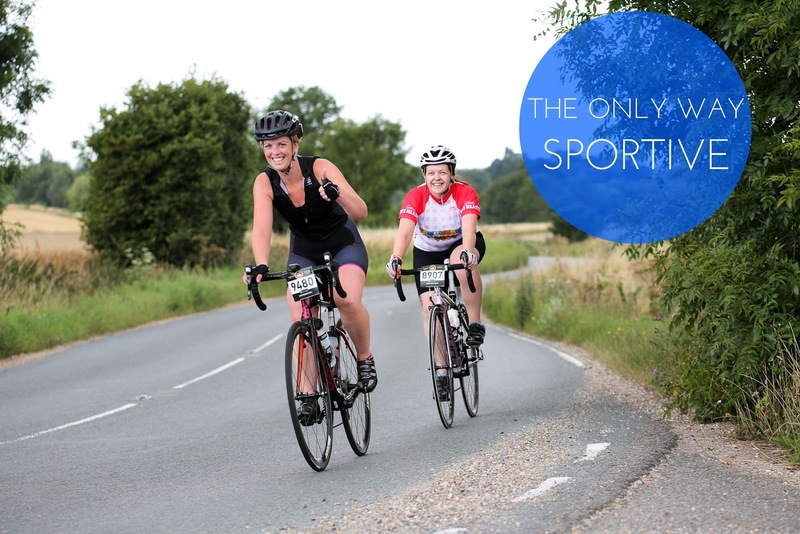 Sportives are non-competitive events and not considered to be a race, but riders do receive a ranking based on finishing time. I was pleased to see that we all got the Gold Award for finishing in well under 3:30. We also received a nice medal, technical T-shirt, Powerbar and pistachios- pretty decent for the £23 entry fee. Unfortunately, we got stuck in the worst traffic on the drive home and sat in the car for over 3 hours- almost as long as we were actually cycling. It was tempting to get back on the bikes and ride home!